In the lead-up to last year’s Paris Climate Talks, thousands of companies pledged to slash their greenhouse-gas emissions – hundreds of them by reducing their impact on forests. One year on, companies that publish progress reports seem to be keeping their promises – but progress is only reported on half of all commitments. 2 November 2016 | ROTTERDAM | Netherlands | If you go grocery shopping in the Netherlands, chances are you’ll end up at one of two stores: Albert Heijn or Jumbo, which together control more than half the Dutch grocery market. That means they sell billions of dollars of beef, bread, and other products made from the “big four” commodities responsible for most of the world’s deforestation: namely palm, soy, cattle, and timber & pulp. Fortunately, both companies have pledged to source most of those commodities “sustainably”, as have hundreds of their peers. But what do they mean by “sustainably” – and are they keeping their promises? Those are critical questions, because the corporate sector won accolades in Paris last year for promising to do its part on climate, and corporate follow-through will be critical to ensuring success at this year’s talks, which begin next week in Marrakesh. 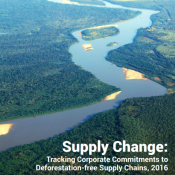 To track that follow-through, Ecosystem Marketplace publisher Forest Trends launched the Supply Change project, which chronicles the progress that companies report on their pledges to reduce deforestation. In the case of these two retail powerhouses, it shows one company offering detailed progress reports and the other offering none – detailed or otherwise. It’s a contrast that’s both dramatically stark and disturbingly typical, says Supply Change Senior Associate Ben McCarthy, who has been tallying the more than 700 pledges his team tracks and finds what he calls the “high-progress/low-disclosure paradox”. Many of the commitments tracked have a target date in the past – namely, 2015 or earlier – but only two-thirds of those have publicly-available progress reports, begging the questions: Do companies only disclose progress when it is good news? How can companies be held accountable for these commitments? And, since the progress information is almost always self-reported, can the numbers be trusted? These questions are increasingly being asked by people far beyond the environmental community as investors – primarily pension funds – come to recognize the economic implications of climate risk. Indeed, the Group of 20 Industrialized Nations (G20) last year appointed former New York Mayor Michael Bloomberg to head the Task Force on Climate-related Financial Disclosures. They published their first report in March and concluded that climate risk-disclosure is foggy and inconsistent across all sectors, creating an economic risk that dwarfs the one that led to the housing crisis. “Decisions made with better climate-related information can benefit the economy in a number of ways, including by: enabling more consistent and accurate pricing and distribution of risks; aiding more informed investing, lending, and underwriting decisions; decreasing the likelihood of large, unexpected changes in asset values; and increasing boardroom engagement on these important considerations,” wrote Bloomberg. “Transparency on a company’s actions is becoming increasingly important, and more investors than ever before are requesting this information through CDP,” says Katie McCoy, Head of Forests at CDP (formerly the Carbon Disclosure Project). Transparency is a cornerstone of corporate social responsibility, and it applies to strategy as well as disclosure. Indeed, company profiles on Supply Change list not only progress on pledges, but any documentation related to them – from strategy documents to interim milestones. McCarthy stresses that Supply Change tracks individual pledges rather than companies. On the progress front, Albert Hein reports that 100% of its palm oil is sustainably sourced, as is 100% of its beef – or at least its veal – while 100% of its soy is certified by the Round Table on Responsible Soy (RTRS), as is all of the soy fed to all of the animals that they sell as meat. For timber & pulp, the company has promised that 100% of its own brand paper and wood products will be certified by the Forest Stewardship Council (FSC) by the end of this year, but they haven’t reported any progress yet. To back everything up, Albert Hein’s parent company has been dutifully filing reports to both the RTRS and the Roundtable on Sustainable Palm Oil (RSPO) for years – first as Royal Ahold, and now as Ahold Delhaize following this year’s merger with Belgium’s Delhaize Group. Jumbo has made similar pledges – at least in palm, soy, and timber & pulp – but as of this week they’ve provided no comparable strategies and reported no progress on their pledges. I reached out to Jumbo directly, and they referred me to a web site – www.jumborapportage.com – which only reiterates their pledges but offers no information on progress. As of November 1, the company has also filed no disclosure material with the RTRS or RSPO, although it did fill out a rudimentary questionnaire for the RSPO. Unfortunately, Jumbo isn’t alone. Of the 703 individual commitments currently tracked by Supply Change, 336 of them – or 52% – have no progress information publicly available. Indeed, the profiles of some commitments, like Danone‘s commitment on milk, show no progress despite the fact that they have clearly taken action to reduce their impact on forests; but in Danone’s case, it’s because the company is working directly with hundreds of thousands of small-scale farmers to completely restructure its supply chains – an effort that’s harder to quantify than is shifting to certified commodities. “Some companies may want to delay reporting until they have a commitment in place and a strategy to deliver it,” says McCoy, who still encourages full disclosure – even if the results are less than stellar. McCarthy says that disclosure isn’t limited to progress on explicit goals, but on milestones that are proving to be good indicators of progress to come. In our next installment in this series, we will examine the emerging indicators of good disclosure, and how to track them.